This large brass gong and mallet are from the Topeka Harvey House. This gong was donated by Ralph E. LaBounty, a Fred Harvey executive who once worked as a busboy at the Topeka restaurant. 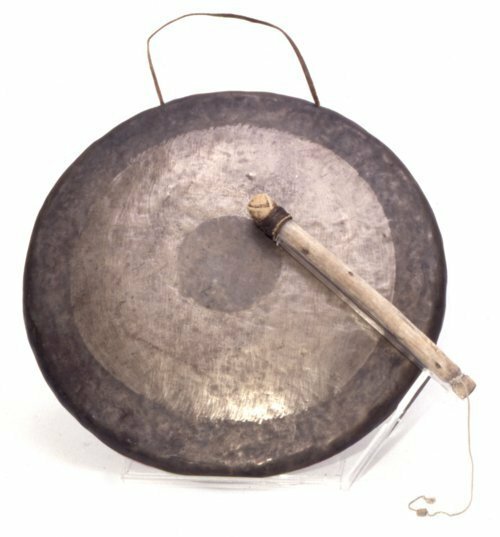 LaBounty had used the gong in his youth, and saved it when the restaurant was torn down. The Harvey Houses were the first chain restaurants, operated in towns along the Atchison, Topeka & Santa Fe rail lines. The gongs were used by employees to alert the waitresses that a train was arriving. Their sound also attracted passengers to the dining room.